How do I even begin to share this news? Some cats have a presence that can’t be explained. That was Diablo Guapo. His spirit and beauty resonated through you. And you didn’t have to know him personally to love him. For those that never met Guapo in person, you still knew him and could feel him. He never knew how his specialness transcended across the globe to all of you. Or maybe he did, and just never let on. He was very humble that way. 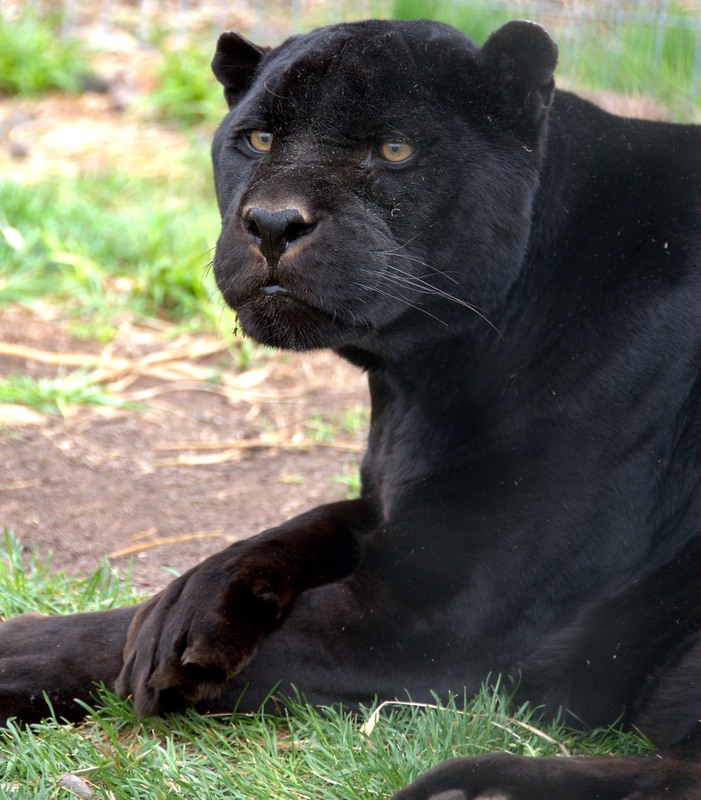 He was such a calm cat who also exuded joyful bliss, especially while playing with enrichment or trotting down the shared wall with his friend Shazam, the leopard. When he first arrived in 2006 from a facility in Colorado that was closing, we knew there was something very special about him. 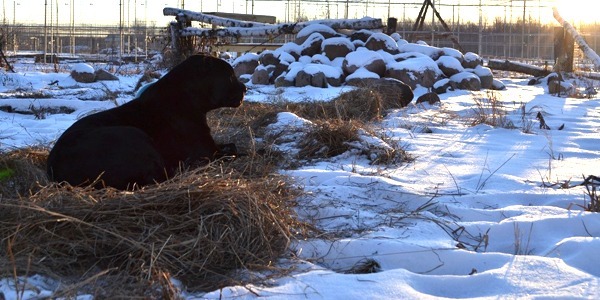 What a patient cat he was – through the transport, through several construction projects to give him better and bigger habitats, and even in his geriatric years, when his body couldn’t get him down the shared wall as fast as he liked. 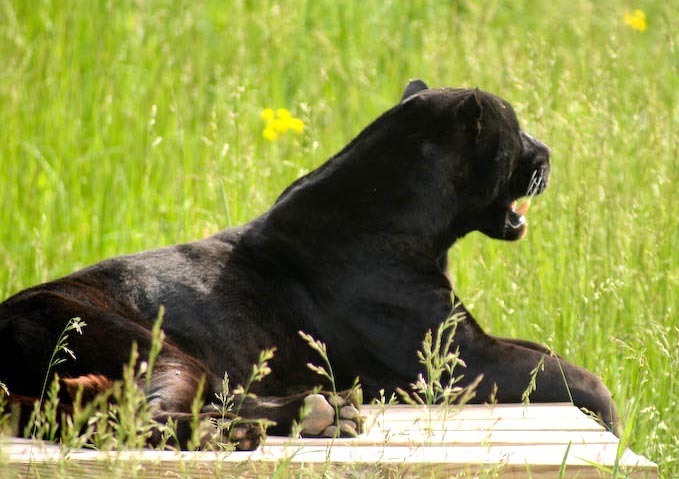 Each cat at The Wildcat Sanctuary has their own personality. Guapo was definitely the most distinguished. He was wise and appeared to be a guide for so many other cats to come, and to us caretakers as well. He felt bigger than himself, and the love each of you have for him confirmed just how special he was, and still is. As he grew older, he was very at peace and comfortable. But he let us know his time was near. He would slow down each day, but remained the calm and distinguished cat we all knew. He was very vocal and continued to talk to us, even as his time shortened. We all knew when we had to say good-bye, and that moment was as heartbreaking as I thought it would be. But what I didn’t expect is, that in that moment, I could still feel his presence. It was a very different and peaceful feeling. I wondered if I was the only one that sensed it. His body was gone, but he was still with us. Then, as we do with all of our bonded cats, we presented Diablo Guapo to Shazam so he could grieve. In the past, all the cats seemed to know even before we did that their friend had moved on. This time was different. Shazam approached the fence and tried to play with Guapo. Even rolling over and purring as he had done for several years. I couldn’t believe it, but it seemed Shazam also still felt Guapo’s presence and that he was still with us, just no longer in physical form. It’s hard to explain why these things happen when we have to say good-bye. But here at the Sanctuary, so many have. When one cat passed in the early hours of the day, the wind picked up and Aslan’s pride began the most lovely roaring session. When another passed, a rehabber came onsite to release a snowy owl and it flew directly to that habitat and perched on a tree before flying back to freedom. Rain and snow have begun to fall during days when it was clear. And double rainbows have appeared . Does something like this happen with each passing? No, some pass quietly. But each passing does cause us to stop and reflect and to remember the love we have for each cat and the lessons they’ve taught us. I believe Guapo and so many others still reign over the Sanctuary grounds. Their spirit and strength will live on through the air we breathe, the energy we feel and the love in our hearts. Sometimes, it is impossible to put in words the love we have for each cat. We are so thankful to have been given the opportunity to know and love Diablo Guapo. And that love will transcend all physical space and time, just as Guapo has. Wise man, know how much you meant to each and every one of us and you will always be with us in spirit. Continue on with your important work, touching so many. Diablo Guapo, a black Jaguar, resided at a big cat rescue facility in CO. Unfortunately, the facility was not receiving enough funding to continue to care for the animals. The Director made the very difficult decision to start placing animals at other facilities, undoubtedly a humbling and difficult decision but the right one considering the alternative. 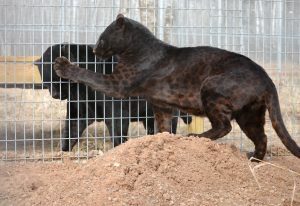 He is a very beautiful and rare cat, breeders were offering up to $17,000 to purchase him. The sanctuary in Colorado wasn’t concerned about money, they were concerned about Diablo’s well being and placed him with us. The translation of Diablo means devil. Not at all fitting for such an amazing creature. We changed his name to Diablo Guapo which means handsome devil. Diablo Guapo is a favorite among staff, volunteers and donors. He is probably our most recognized resident next to Titan, the bengal tiger. His laid back attitude and goofy personality draw everyone in. One of his favorite things to do is paint; he is quite the artist. Using non-toxic washable paint, the keepers spread it on a canvas and watch the artist go to work. You can help provide daily care for Diablo Guapo by sponsoring him today. Your help will be greatly appreciated.